刘阳, 张韶华, 梁焯南, 朱毅朝, 梁桂. 广东省深圳市2017年褐家鼠对抗凝血杀鼠剂抗药性研究[J]. 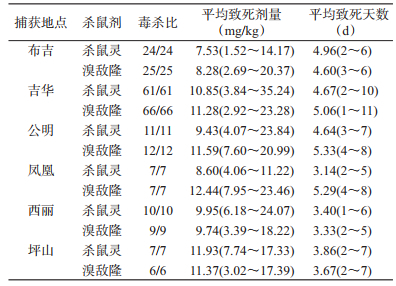 中国媒介生物学及控制杂志, 2018, 29(6): 617-620. LIU Yang, ZHANG Shao-hua, LIANG Zhuo-nan, ZHU Yi-chao, LIANG Gui. 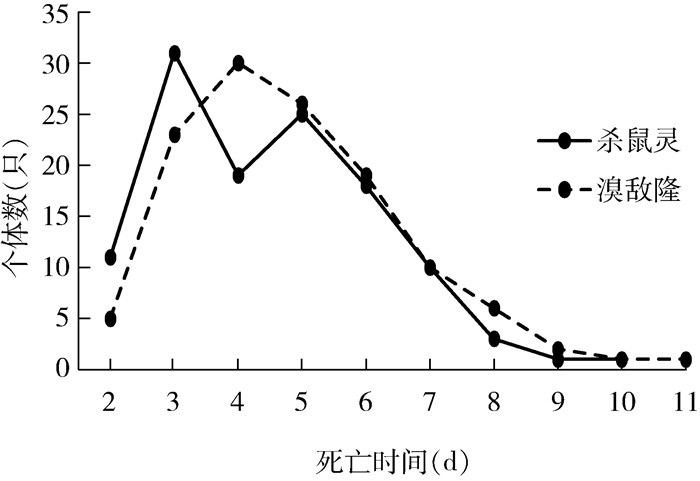 Study on resistance of commensal rats (Rattus norvegicus) to anticoagulant rodenticides in Shenzhen[J]. Chin J Vector Biol & Control, 2018, 29(6): 617-620. Corresponding author: ZHANG Shao-hua, Email:zhshh999@tom.com. Abstract: Objective To investigate the resistance of Rattus norvegicus to first and second generation anticoagulant rodenticides in Shenzhen, provide science evidence to choose rodenticides in deratization. Methods Test rats were caught by mousetrap from residential area in 4 municipal districts of Shenzhen city in 2017. Non-selective feeding trial was used in this study, the poison bait contained 0.005% warfarin and 0.005% bromadiolone. Excel software was used for data input and collating, SPSS 16.0 software was used for statistic description and statistical analysis. Results Warfarin-and bromadiolone-resistant individuals were not detected in all 245 rodents. The average lethal dose of warfarin was 9.87 mg/kg, and the average time of poisoning symptoms appearing and death was 3.06 d and 4.48 d respectively. The average lethal dose of bromadiolone was 10.69 mg/kg, and the average time of poisoning symptoms appearing and death was 3.32 d and 4.82 d respectively. The lethal dose had significant difference between different collection sites. Conclusion Although R. norvegicus are susceptible to warfarin and bromadiolone in Shenzhen at present, the possibility of resistant development still exists. Deratization procedure normalization and well-palatability rodenticides should be considered to enhance chemical control effectiveness. 蔡春林, 陈戊申, 陈伟红, 等. 深圳地区流行性出血热疫点鼠类汉坦病毒血清学调查研究[J]. 中国卫生检验杂志, 2017, 27(1): 127-128. 邓良利, 马林, 刘竹, 等. 成都地区褐家鼠对杀鼠灵和溴敌隆的抗药性调查[J]. 医学动物防制, 2013, 29(4): 367-368, 371. 王飞, 蒋璐, 宋长飞, 等. 褐家鼠对杀鼠灵和溴敌隆抗药性的测定[J]. 中华卫生杀虫药械, 2014, 20(4): 326-328. 徐仁权, 刘洪霞, 张春哲, 等. 上海地区家栖鼠对抗凝血杀鼠剂的抗药性现状调查[J]. 中华卫生杀虫药械, 2013, 19(1): 20-25. 李华民, 高燕, 谭梁飞. 咸宁市褐家鼠对杀鼠灵的抗药性研究[J]. 中华卫生杀虫药械, 2014, 20(1): 43-44. 鼠类抗药性监测协作组. 家栖鼠对抗凝血灭鼠剂抗药性的检验方法[J]. 中国媒介生物学及控制杂志, 1991, 2(5): 339-340. 邓良利, 孙毅, 田汶佳. 成都地区抗药性褐家鼠维生素K环氧化物还原酶编码基因的变异[J]. 医学动物防制, 2016, 32(12): 1353-1355, 1417. 宋英, 李宁, 王大伟, 等. 鼠类对抗凝血类灭鼠剂抗药性的遗传机制[J]. 中国科学:生命科学, 2016, 46(5): 619-626. 陈蔚恩, 李选云, 钟柳青, 等. 0.005%溴鼠灵饵剂的适口性及其现场灭鼠效果研究[J]. 中华卫生杀虫药械, 2016, 22(3): 239-241.